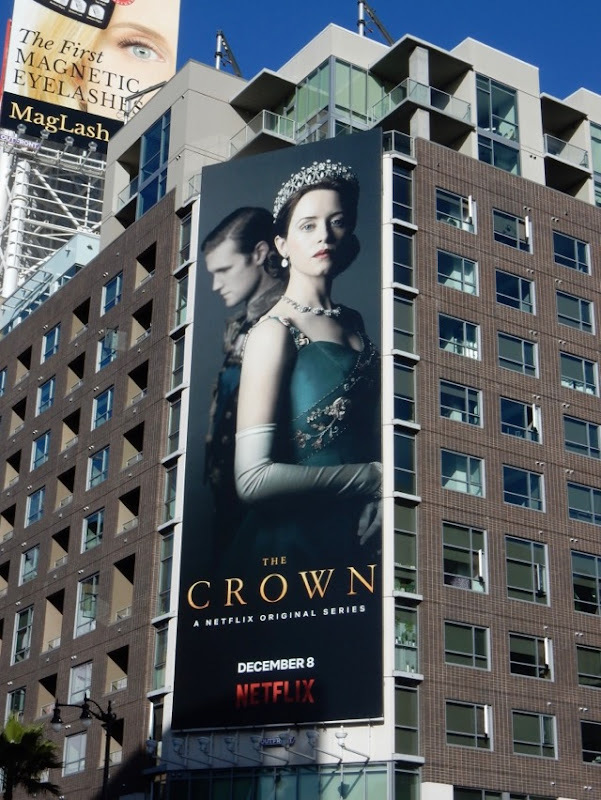 This December as an early Christmas treat Netflix's lavish period drama The Crown returns for a right royal sophomore season. 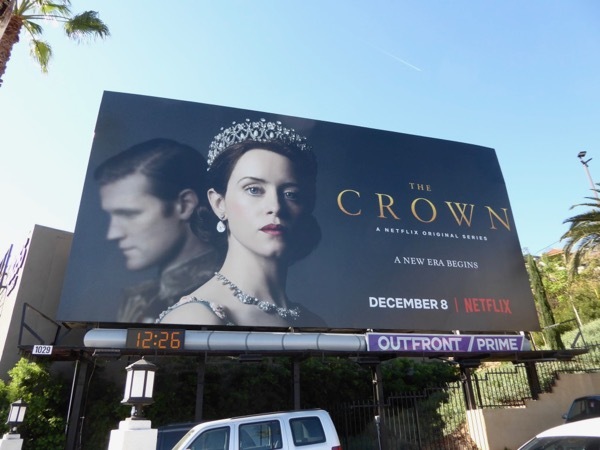 Golden Globe-winner Claire Foy reprises her role at Britain's Queen Elizabeth II and Matt Smith the monarch's husband, Philip, Duke of Edinburgh, and these more somber ad creatives hint at the duty of the throne and the strained relationship between the couple. 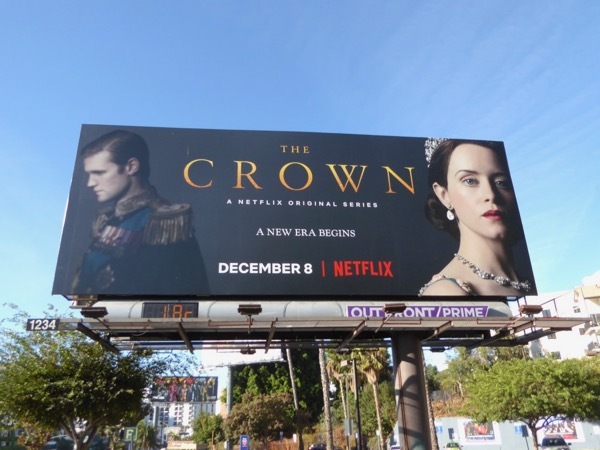 As well as examining their fractured marriage, the new season will also examine British political controversies through the eyes of the Queen, including the 1956 Suez Crisis, the departure of U.K. Prime Minister Anthony Eden and the arrival of his successor Harold MacMillan. 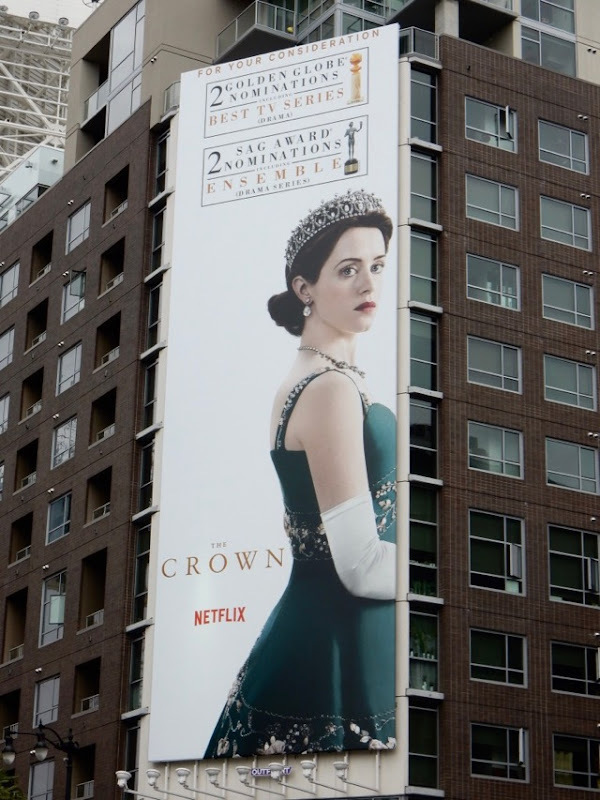 For their final season (before Broadchurch's Olivia Colman takes the reign as Her Majesty for a new era), expect the return of Vanessa Kirby as Princess Margaret and Victoria Hamilton as the Queen Mother, plus new additions to the cast like Matthew Goode as Lord Snowden and Dexter's Michael C. Hall as U.S. President John F. Kennedy. 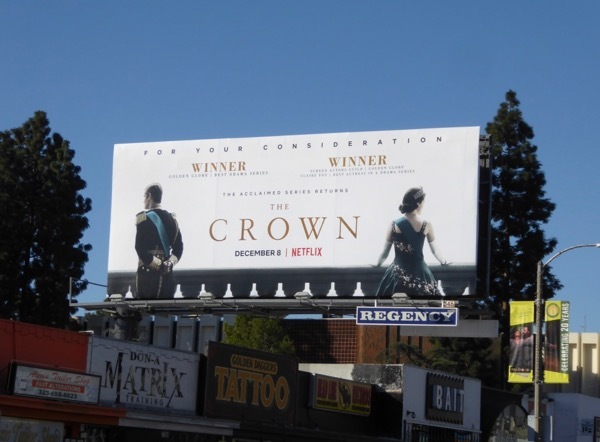 These season two billboards which also double as a 'For your consideration' campaign for Hollywoodland's awards season, were snapped along Sunset Boulevard, Melrose Avenue and Santa Monica Boulevard from November 28 to December 1, 2017. 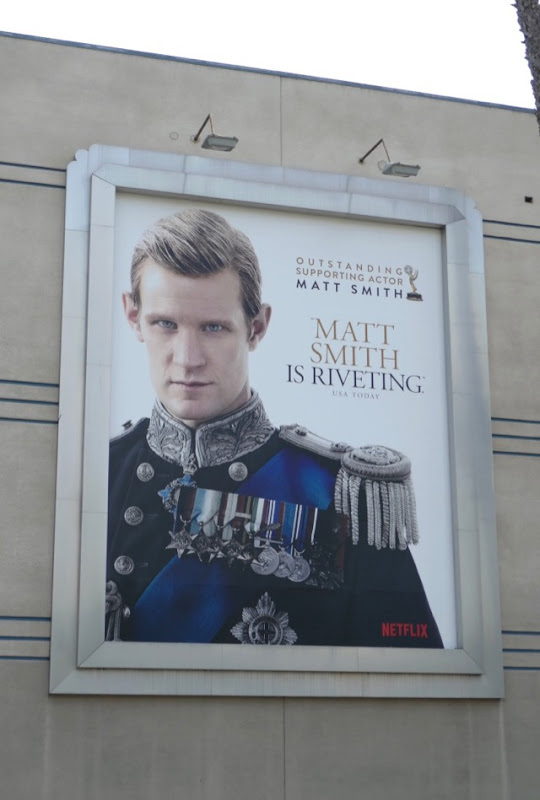 Fans of the British royal drama can also enjoy these season one billboards for The Crown, plus Matt Smith admirers can check out these Doctor Who billboards. 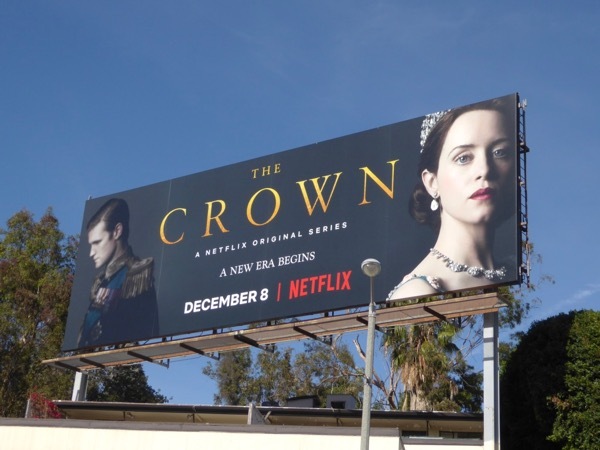 Let's hope the streaming service's acclaimed-series can continue its historical reign with its binge-worthy all-new episodes. 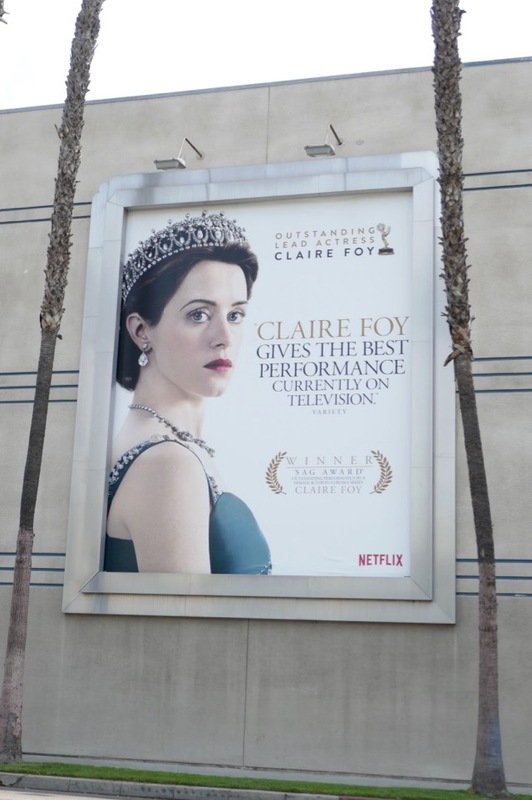 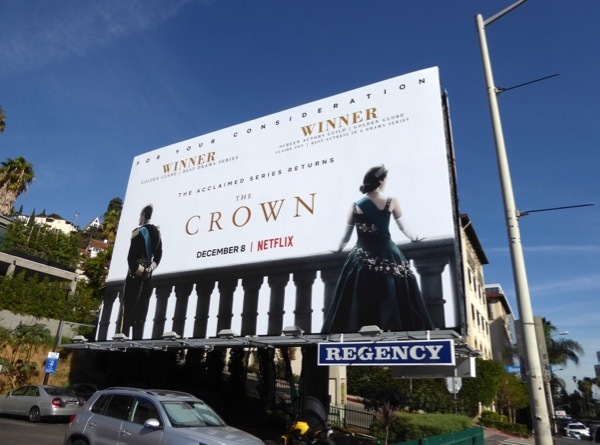 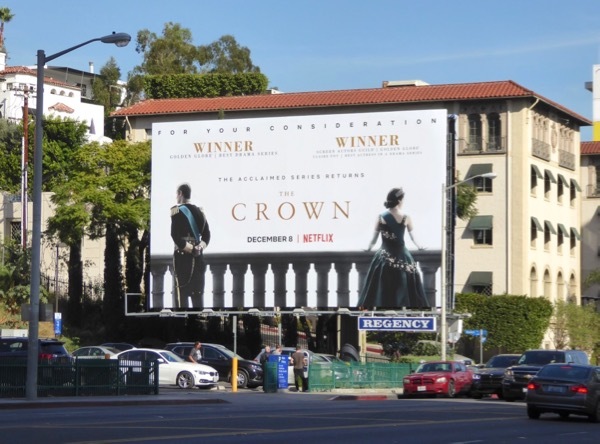 UPDATED: Here's another vertical ad creative with Claire Foy looking very regal and poised, spotted along Hollywood's Vine Street on December 7, 2017. 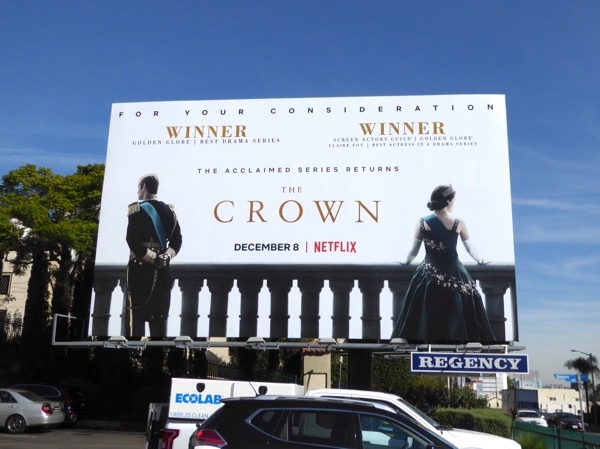 UPDATED: Here's also an awards nominations billboard for the sophomore season, including two Golden Globe nods and two Screen Actors Guild nominations, spotted along Melrose Avenue on December 27, 2017. 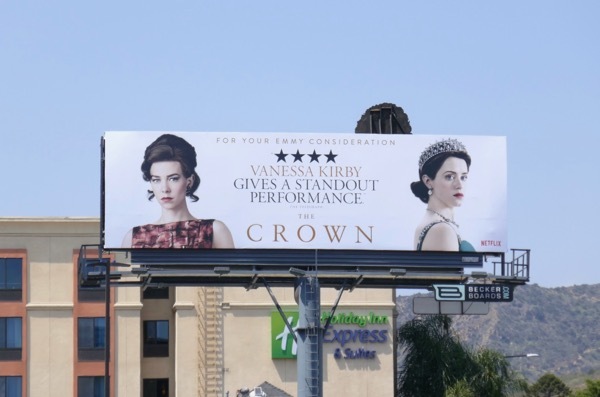 In addition here's another vertical ad creative for awards consideration spied at Hollywood's Vine Street on January 19, 2018. 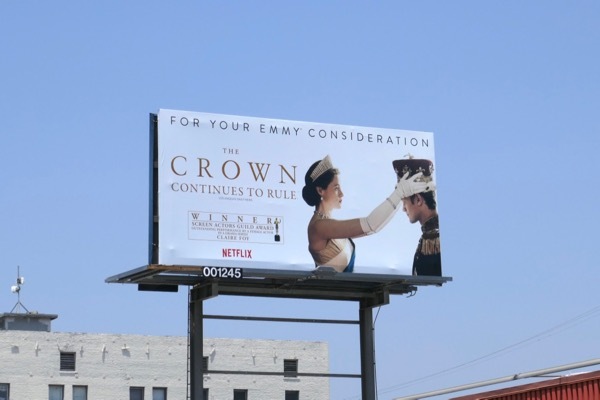 UPDATED: Here's also an awards consideration billboard for Emmy season for the show's sophomore season. 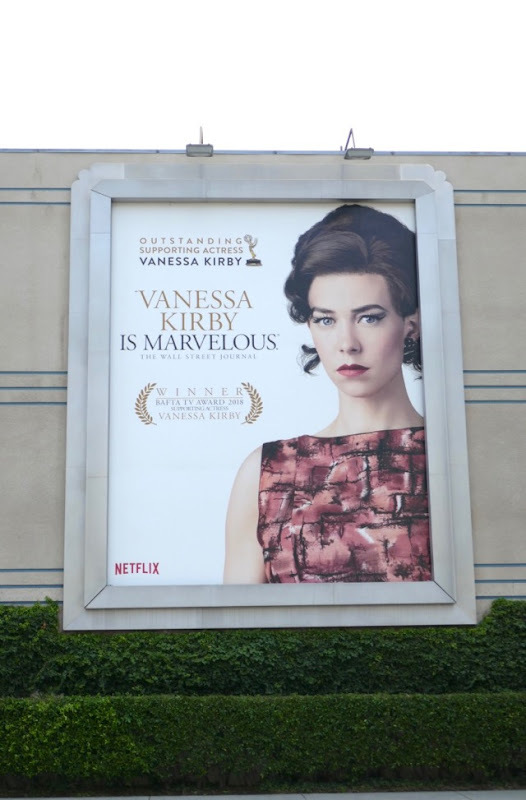 This version shining a spotlight on Vanessa Kirby's performance was snapped along Highland Avenue on May 14, 2018. 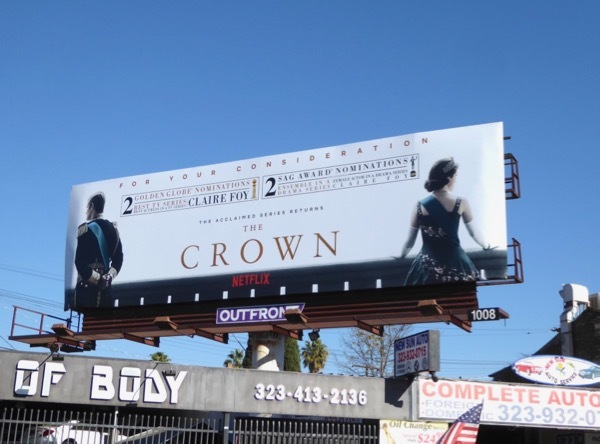 Plus here's another version for the second season spied along Pico Boulevard on May 16, 2018. 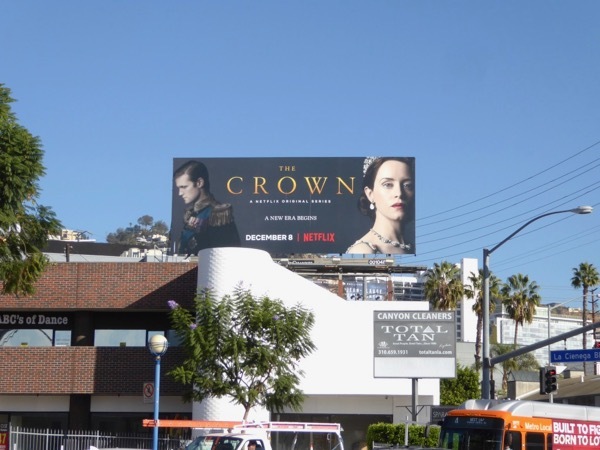 Hopefully the pay discrepancy scandal between Matt Smith and Claire Foy (he was paid more than the leading lady because of his high-profile as Doctor Who) won't ruin the show's chances this season. 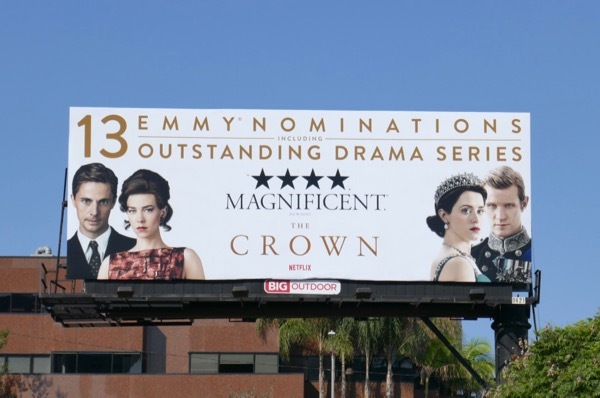 And here's another small Emmy FYC billboard spotted along Santa Monica Boulevard and on June 7, 2018. 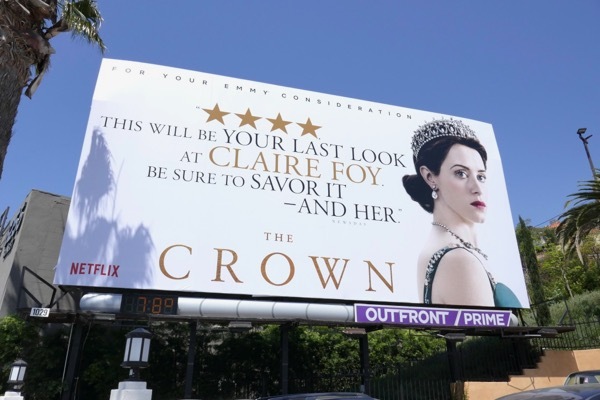 Plus as Claire Foy now departs the series after two stellar seasons (and one salary controversy), here's another FYC billboard snapped along the Sunset Strip on June 8, 2018, singing her praises. 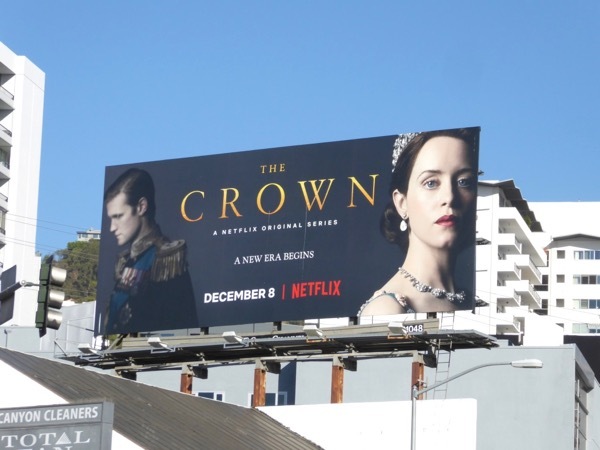 UPDATED: Congratulations to The Crown for landing thirteen Emmy nominations for its sophomore season, including Outstanding Lead Actress for Claire Foy, Outstanding Supporting Actress for Vanessa Kirby, Outstanding Supporting Actor for Matt Smith, Outstanding Guest Actor for Matthew Goode and Outstanding Drama Series. 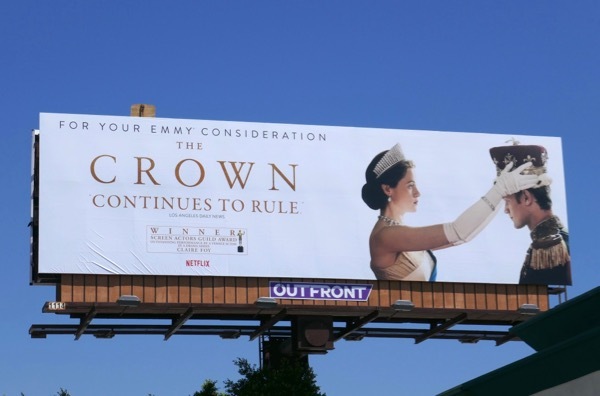 This Emmy nominee billboard was snapped along Santa Monica Boulevard at Beverly Glen Boulevard on August 1, 2018. Fans of the Netflix show can also check out these costumes from the second season of The Crown on display. 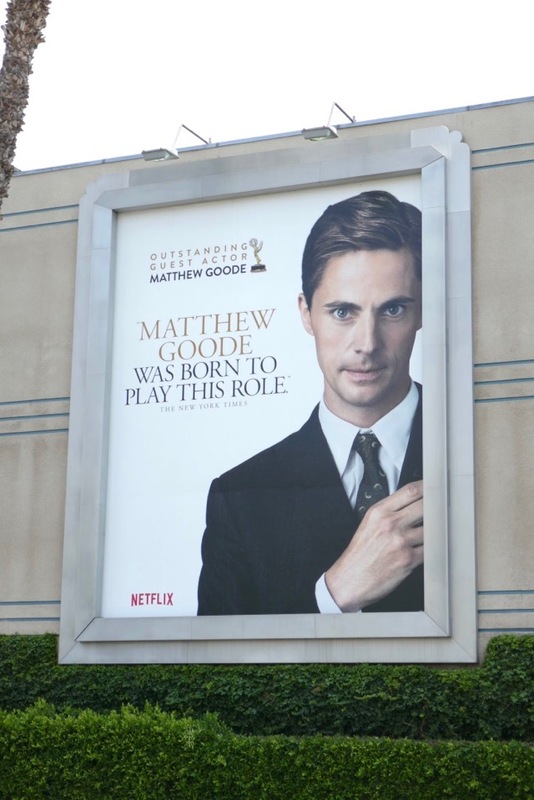 UPDATED: Here's also some addition portrait ad support for the Emmy nominees and the show itself spotted along Melrose Avenue at Raleigh Studios on August 9, 2018. 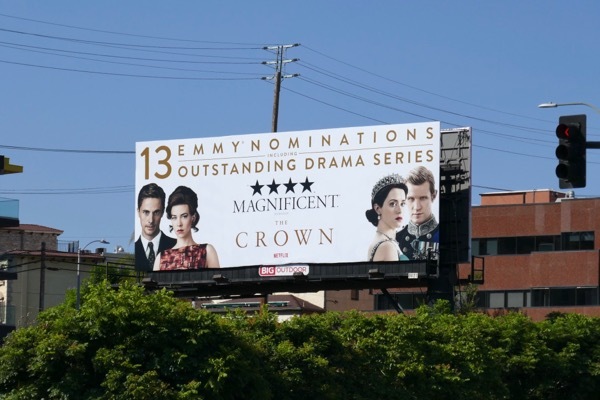 How many of the thirteen Emmy nominations do you think The Crown will take home this September?